DTV Group formed in the 1980's to support undergraduate video production and television distribution at Brown University (BTV) and Harvard University (HRTV). We built multi-camera switched video studio facilities for both universities. 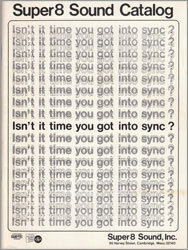 In 1988, we helped Matt and Patrice York launch Videomaker Magazine. We wrote several columns on Desktop Video for Videomaker. In 1993 we researched analog video editing and synchronized four Hi-8 camcorders to do four-camera multi-track post-production editing. Our Hi-8 Users group merged into DTV Group in 1995. 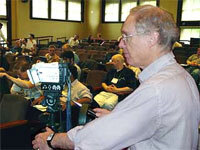 Bob Doyle, the first director, and Jeff Sauer, the second director of NewMedia Lab, wrote many articles for NewMedia Magazine on camcorders, non-linear editing systems, video hard drives, multimedia projectors, and dynamic web publishing systems. DTV Group recorded over 80 hours of videos at conferences on content management and structured publishing for CMS Review, who published them to the web. From 1973 to 1978, our Director, Bob Doyle, was the CEO of Super8 Sound, where he pioneered double-system synchronous sound recording and editing for Super8 Professionals. As a full member of the sound engineering committee of the Society of Motion Picture and Television Engineers, Bob helped specifiy standards for digital synchronization signals between Super-8 film cameras and audio tape recorders. American Cinematographer magazine devoted the November 1975 issue to Professional Super 8 tools and techniques developed by Super8 Sound.